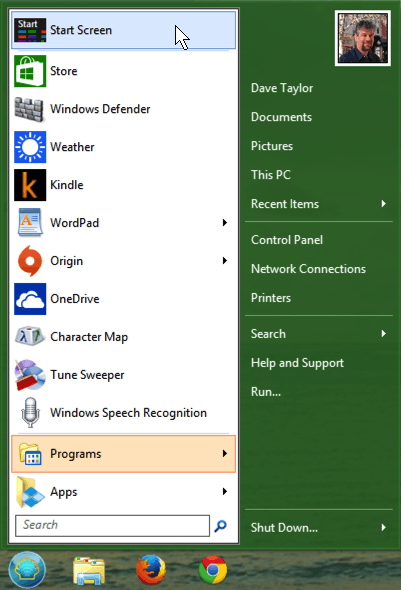 Can I add a Start Menu to Windows 8? I don’t mind Windows 8 too much after using it for a while, but I really can’t get over the loss of the Start Menu. I know 8.1 puts a button on the lower left of the screen, but I want my menu. How can I fix it? You raise a huge issue, one that’s the greatest complaint people have about Windows 8 and Win8.1: that the handy start menu has become a start screen and that the very concept of “everything running on the Desktop” has been reinvented to be lots of windows and some apps running within their own worlds while others still run within the Desktop environment. It’s confusing, to say the least. But Microsoft’s pretty insistent that the Start Menu no longer has a place in the world of Windows 8. My theory, by the way, is that they’ve been too focused on the tablet and touch device experience, where the Start Screen with its different size tiles works really well. That’s good for a Win8 tablet computer, but if you have a desktop or laptop device, it’s a big leap, probably too big a leap. And then there’s the dopey “Windows button” that showed up when we jumped from Windows 8 to Windows 8.1. All it is, however, is a shortcut to the Start Screen, so it’s rather the worst use of screen real estate ever. Windows 10 brings back the Start Menu, you’ll be glad to know, but it’s weird looking because part of it (in the current pre-release) ends up looking like the different size tiles from the Win8 Start Screen anyway. Bizarre. Fortunately third parties have you covered, and there’s a very nice Start Menu program you can download and install on your Microsoft Windows 8 computer to restore the beloved menu. Better yet, it’s free! Pretty much useless, in my opinion. Click on the rightmost element of this button, where the tiny downward pointing black triangle can be found. If you’re guessing that you should choose “Open”, you’re right. Do so. Nice of them to be so welcoming! 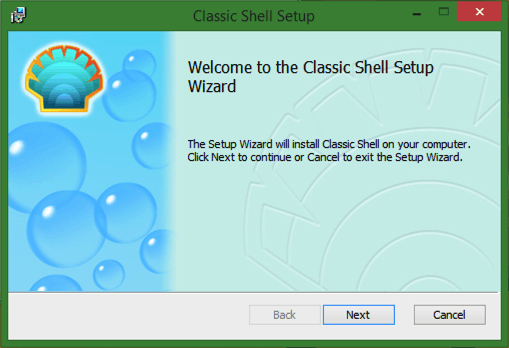 Click on “Next” and follow the steps to install the Classic Shell on your system. Once fully installed, you can change the start button on the lower left (see the lowest portion of the window, below) but even if you leave the daft white Windows button, it can now launch Classic Start Menu instead. I decided to switch to the Aero “shell” button and use the Windows 7 style menu. Easily configured! Ahhh…. life is good again! Oh how I miss the Start button! I’ve reset my computer back to Win8 as for some unknown reasons some of my software misbehaves under Win8.1 and so I lost that stupid, poor excuse for a Start button. Many thx and welcome back START!